EARTHARTISTRY's purpose is to encourage the awakening, development, integration and flowering of the whole human being. Our intention is to assist in the transformation of human consciousness from an "EGO-centric" Age into an "ECO-centric" Era. We wish to be a catalyst in the transition into what Thomas Berry calls "The Ecozoic Era." As we shift from a dualistic mind-set that is geared for offense and defense, into a unitive, multi-dimensional, awareness that recognizes whole systems and cultivates the arts of peace, we initiate this new way of being. Humans are leaving the illusion of separation, and birthing a new identity that recognizes its essence and roots in the formless realm of being, as well as in the outer community of the Earth and the Cosmos. EARTHARTISTRY encourages love and appreciation for the great intelligence of Mother Earth and a deep understanding of our ecological inter-connections. 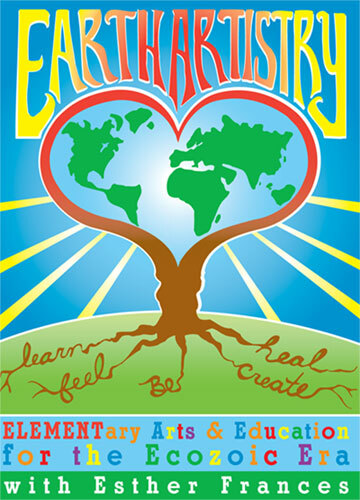 The word Earth contains three words that are at the core of the EARTHARTISTRY vision: heart, art and ear. We cultivate the arts of love, creativity and listening, enabling us to benefit, care for and contribute to our selves and the Earth Community. We offer programs that help awaken us to the unity, interdependence and diversity of all life. EARTHARTISTRY is inspired by five modes of intelligence, represented by the five elements. Space is at the center of our mandala: the formless, timeless, essence that is the source of all that is. We regard this awareness as primary and place it at the center because it is the key to wisdom and self-knowledge. Space, or consciousness, is the foundation for all intelligence and allows for the integration and deepening of each of the derivative modalities. Fire represents imagination, inspiration, creativity, movement and the ability to initiate and take action. Air includes the intellectual and academic learning, literature and stories, as well as the art of communication. Water refers to emotional intelligence, including the capacity to empathize, feel and imagine. Earth includes our ability to perceive sensation, to be awake and aware in the body, able to appreciate the beauty of nature and to translate our learning into practical application in the world. We embrace deep ecology, inter-disciplinary and inter-generational learning. Our needs to be, imagine, create, feel, communicate, inspire and be inspired are not separate and all need to be respected and nurtured. We are committed to art from the heart, for the Earth! We experience learning as a great joy, play as its natural modality, and creativity as its natural offspring. Humor, fun, and celebration are essential spices in the feast of learning and we are committed to make plenty of space for their emergence! This program is based on the reading of the picture book Born with a Bang, Book One: The Universe Tells Our Cosmic Story: By Jennifer Morgan; illustrated by Dana Lynne Anderson. The story begins with a letter to "My Dearest Earthling" from the Universe. The Universe continues to tell the tale of its origins, the birth of the particles, elements, atoms, stars, galaxies, our Sun, and the planets and finally becomes each one of us. The songs "Oh Yeah" and "Spaceship Earth" from the CD "Mother Earth Calls" by singer/songwriter Esther Frances accompany the presentation. The children are encouraged to dance and sing during these interludes. At the conclusion of the story, the participants are asked what they learned. A short synopsis of what "I learned" from the story, from the point of view of the Universe, brings the session to a close, concluding with another round of one of the songs. I learned: to turn a dream into a reality; that even giant things start out small; that to build things I need building blocks; that I love to experiment; that there are special times for doing things, or I would lose my chance; that I couldn't be creative without being destructive too, etc. The story in its entirety is appropriate for third grade and older children and inter-generational groups. Teachers report that they enjoyed the experience. An abbreviated version is available for younger children. The session for older children or inter-generational groups is approximately 45 minutes. The session for the very young ones is 20-30 minutes. "When returning from the Moon, I experienced directly and emotionally the personal connection to the Universe described by Jennifer Morgan. We are the way the Universe knows itself. We are it and it is us. All together we are wonderful and amazing." This program is based on the reading of the picture book From Lava to Life, The Universe Tells Our Earth Story, Book Two, from the series by Jennifer Morgan; illustrated by Dana Lynne Anderson. This story also begins with a "Letter from the Universe." The story continues to describe the Earth's development, and the very first Earthlings, the bacteria. We learn of the oxygen crisis and Earth's first great extinction when oxygen became a poison to bacteria and how it was solved. We learn of the development of animals, plants, fungi, the age of dinosaurs, and the advent of mammals before this story concludes. As in the first of the series, this book also concludes with an opportunity for the participants to share what they just learned followed by an interesting synopsis of what "I," as the Universe, learned. The songs Bacteria and Gaia from the CD Mother Earth Calls by singer/songwriter Esther Frances accompany the presentation. Singing with the songs and dancing are encouraged. The story in its entirety is appropriate for third grade and older children and inter-generational groups. Teachers report that they enjoyed the experience. An abbreviated version is available for younger children. The session for older children or inter-generational groups is approximately 45 minutes. The session for the very young ones is 20-30 minutes. "We want to thank you for allowing us to use your "Bacteria" song as part of our 2007 symposium, "Small Matters: Microbes and Their Role in Conservation." It was the perfect accompaniment to our symposium's public program, "Save the Microbes, Save the World!" "Gaia's lyrics are exquisitely fitted to the need for children and for all of us to enjoy with all possible senses the beauty, wonder and integrity of Earth and all its creatures as one sacred community." Esther at The Inquiring Mind Book Store with Saugerties elementary school students. This program is based on the reading aloud of Mammals who Morph, Book Three of The Universe Tells Our Evolution Story , from the series by Jennifer Morgan; illustrated by Dana Lynne Anderson. Again, we begin with a "Letter from the Universe." We learn how mammals emerged as the dinosaurs went extinct when the great meteor hit Earth 65 million years ago. We follow the development of birds, apes and early humans. Crisis is examined as a source of great creativity and opportunity. This book also concludes with an opportunity for the participants to share what they just learned followed by an interesting synopsis of what "I as the Universe," learned. The songs "Pachamama" from the CD "Mother Earth Calls" and the original song "Mammals" by singer/songwriter Esther Frances accompany the presentation. Singing with the songs and dancing are encouraged. The story in its entirety is appropriate for third grade and older children and inter-generational groups. An abbreviated version is available for younger children. The session for older children or inter-generational groups is approximately 45 minutes. The session for the very young ones is 20-30 minutes. "Mammals Who Morph is a fantastic journey through time. It is the story of mammalian evolution told in a way that will engage and enchant, as well as educate, children and adults alike. It is a must for every school library-and I shall give it to my grandchildren and my godchildren for Christmas and holiday presents." These stories are inspired in part by the work of cosmologist Brian Swimme, cultural historian, Thomas Berry and eco-biologist Elisabet Sahtouris. Esther has been mentored by Thomas Berry since 1984. Description from the ZERI website: In this story, a whale talks to a sea gull. The whale is sad because he would like to fly. But the sea gull makes him realize that he has the biggest heart in the world. In the story you will learn how the whale's heart is an incredible pump; pumping 2000 liters of blood with every beat! Reading this story you will also discover that your heart is making electricity! Yes, right now! And you will learn how you can start to make electricity in your very own kitchen, simply by doing it in the same way that nature does. Nature is amazing! It uses tiny amounts of energy to do some really amazing things. And it does these things without producing any waste. People also make electricity, but not half as well as nature does. Have you ever seen a smoke stack from a coal powered energy plant? Have you seen all of the black smoke that pours out of it? Have you ever seen a whale with a smoke stack and black smoke coming out of it? There is a man named Jorge Reynolds, who inspired the story 'The King of Hearts'. He has a wonderful job. He travels around the oceans studying whales. His studies taught us about the electricity in the whales heart. Jorge has learned a lot about whales that we can use to help humans. This is the kind of work that scientists are doing every day. Wouldn't that be fun? We read the story, learn about Dr. Jorge Reynolds and sing-along with the chorus to "In the Belly of the Whale," an original song by Esther Frances. In this story we learn about mushrooms and the many ways they can contribute to providing enough food for everyone on the planet to be healthy. The story revolves around a dialogue between a cow and a mushroom. They learn about each other, and the many ways that they can each contribute to making a better world. We also learn about scientist Ivanka Milenkovic, who inspired the story, through her work with mushrooms. Esther's original songs "Gaia" and "Connect the Dots" provide interactive accompaniments to the story. Each song has a chorus that is fun and continues to emphasize inter-dependence, inter-connection, cooperation, and appreciation of both unity and diversity, showing how they complement each other. Gunter Pauli, is the author of the ZERI fables and founder of ZERI. They are particular suited for children ages nine through twelve, and part of a larger curriculum to promote eco-literacy. There are 29 of these fables. "Esther is one of those few who can take scientific knowledge and turn it into art - a navigator in both worlds." Gunter Pauli, founder of ZERI, author of Upsizing, the ZERI fairy tales, and former President of Ecover, Europe's first ecological factory. Esther Frances is a certified 2002 ZERI practitioner. This is a process developed by Joanna Macy and John Seed that deepens our awareness of the interconnectedness of all beings. In this program, we experience the aloud reading of "The Story of Granny Green," by Esther Frances. Granny Green is a grand old maple who experiences illness when her parts forget they are all apart of the same tree. The theme weaves in the natural cycles of growth and decay, birth and death, unity and diversity, and examines how we can all appreciate each others differences and how they contribute to making the whole more beautiful and healthy. Esther's songs "Bacteria" and "We Are the Spirit Within It All" accompany the story. Singing and dance are encouraged during these portions of the program. ""Granny Green: We Are The Spirit Within It All" is delightful and inspiring reading for children of any age, especially when accompanied by the lyrics and music of this talented composer." This book of poetry by Esther Frances offers poems about all the colors of the rainbow. It can serve as an invitation to discovering the joy of writing and self-expression. Reading groups are also available for classics such as J. Allen Boone's Kinship With All Life, Black Beauty by Anna Sewell and Spinning Inward by Maureen Murdock. Esther is available as a teaching artist in schools and for home school students. She will also don her rainbow wig and come to young children's parties as the character "Granny Green" to read stories, sing, dance and have fun. Esther is available as a guest speaker for service clubs, colleges and libraries. EARTHARTISTRY offers workshops, classes and adult reading groups. Sample Topics: Every Day Is Earth Day; ZERI and The Role of Systems Thinking in Education, Design and Conscious Society; The Dream of Earth Is Waking: Your Role in Awakening the New Earth; The Eartheartist's Way: A New Identity for a New Way to Live. Reading Groups: We can select from books such as A New Earth by Eckhart Tolle, The Untethered Soul by Michael Singer, Thank God for Evolution by Michael Dowd, When Fear Falls Away by Jan Frazier and Nonviolent Communication by Marshall Rosenburg. Books by Dr. Jean Houston, Matthew Fox, Joanna Macy, Brian Swimme, Thomas Berry, John Perkins, Masura Emoto, and Dr. Gay Luce have also been instrumental in the shaping of EARTHARTISTRY. The groups are supplemented with experiential processes and interaction. "Esther Frances participated in our spring 2006 weekly story our for the students of Cahill Elementary School, grades four through six, providing three readings. Esther exceeded our expectations for our learning criteria. Her gift is to combine learning with art. She read from Jennifer Morgan's Universe Series and taught the children the chorus from songs from her CD "Mother EARth Calls," accompanied by the original "music only" soundtrack. Esther encouraged the students to move and dance. I watched with pleasure as the students respectfully and without inhibition shared and voiced what they learned from the stories and songs. With the positive feedback we received from the teachers I know Esther would be a great source of inspiration to teachers in their own classrooms. It was a pleasure to work with her." "Esther Frances has conducted many workshops here at Mirabai Books and our community of seekers has devoured her sage teachings. Rarely have we received so much positive feedback on a teacher. She has become an integral member of our workshop faculty and we have the highest regard for her professionally and spiritually." "Esther Frances has worked as a faculty member of the Omega Institute's Holistic Studies Program for staff since 1997. Her classes are a fluid mix and occasional blend of The Human Capacities Program, ZERI work, poetry, myth, ecology, The Universe Story and astrology. The staff here has loved learning from Frances over the past eight years, and she has also been a joy for me to work with as well, always easy going and charming in all our interactions. "I know of personal friends of mine who have deeply benefited from Esther's astrology readings, and have witnessed the growth of her students over the years. I would be happy to recommend Esther as an instructor of the above modalities, or as an individual astrology reader. (She has also worked as an astrologer for many years at The Omega Wellness Canter.)"